Despite some political commentators insisting that the White House release of what it claims to be Barack Obama’s long form birth certificate represents the end of the “crazy birther fringe” movement, those who most fiercely pushed doubts surrounding the president’s eligibility are not convinced. While presumptive Republican candidate Donald Trump welcomed the release of the document, he was quick to cast suspicion as to why it took so long and if the certificate was even genuine. Trump said it was “amazing” that the document surfaced “all of a sudden” after he had begun asking questions about the controversy, adding that the certificate should be analyzed to determine its authenticity. Meanwhile, World Net Daily editor Joseph Farah, who has been at the forefront of the birther movement, heavily promoting Jerome Corsi’s investigations into the matter along with his new book, Where’s The Birth Certificate?, reacted to the news by saying the birth certificate “raises as many questions as it answers”. 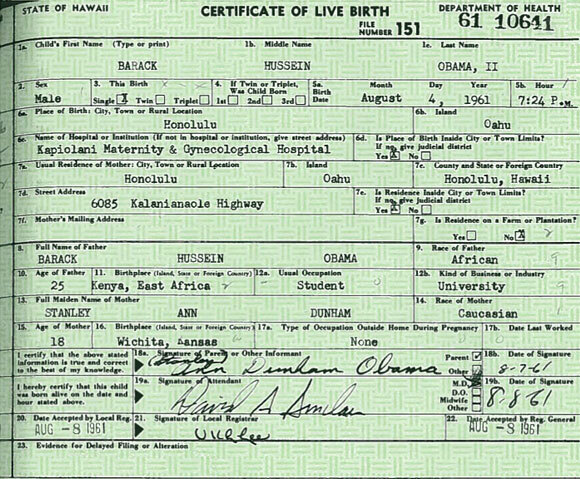 At the center of the storm is the argument about whether the fact that Obama’s father was born in Kenya, which is confirmed on the document released by the White House today, makes Obama ineligible to become president because he is not a “natural born citizen” of the United States. “Some of the cases challenging Obama have explained that he was a dual citizen through his father at his birth, and they contend the framers of the Constitution excluded dual citizens from qualifying as natural born citizens,” reports WND, meaning that the document released by the White House today could even lead to proving Obama’s ineligibility. “The news media and the political establishment were quick to rush to judgment regarding Obama’s eligibility in 2008, without any basis. It would be a big mistake for everyone to jump to a conclusion now based on the release of this document, which raises as many questions as it answers,” Farah said today. Some political commentators have hastily insisted that the release of the document means, “The “birther” movement is now dead as a political force,” a rush to judgment given the fact that the White House’s direct involvement now means the entire controversy will only continue to generate attention. Since the American people have been habitually lied to about everything under the sun, with trust in government at an all time low, a PDF file put out directly by the Obama administration itself isn’t going to make the furore die down at all, and will only lead to claims that the document is a carefully crafted fake.